Inside: Toddler tantrums are no joke. 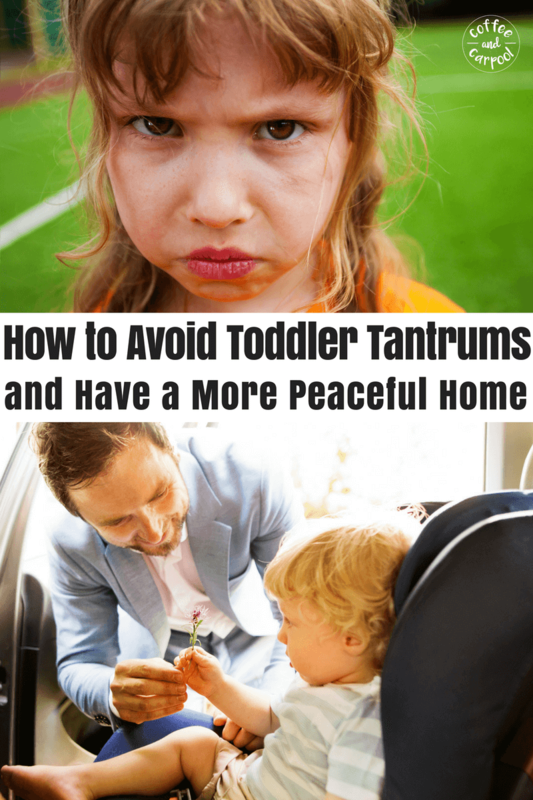 But there’s a trick to prevent toddler tantrums before they even begin. There’s a simple way to get toddlers to do what you need them to do without a fight. I sat on my next door neighbor’s floor trying to distract her two-year-old daughter. My friend was struggling to get medicine into her mouth to no avail. 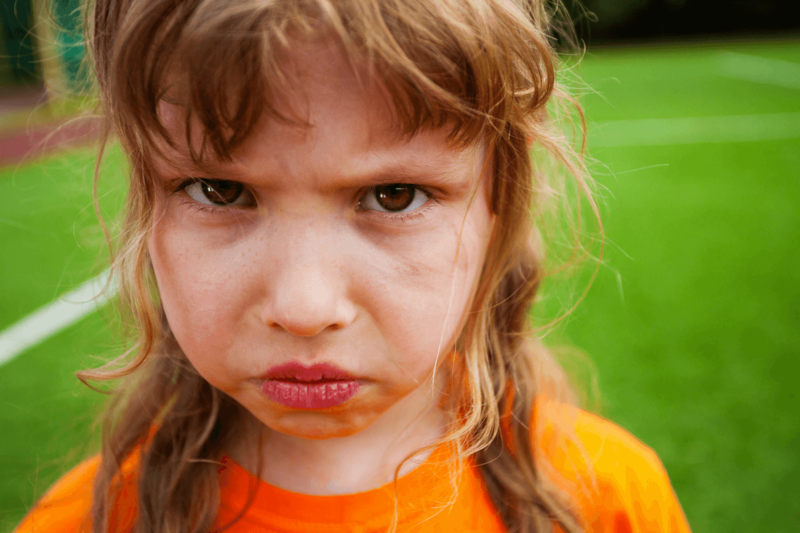 This strong-willed toddler was not having it. She was wailing, begging her mom to stop, flailing her arms and legs and was desperate to get away. And she was on the verge of a full-blown tantrum. My girlfriend was ready to implore us all to hold her daughter down so she could force the medicine in her mouth, tantrum or no tantrum. This little girl had to take her medicine. I’ve had to force eye drops on my eldest daughter and disgusting-tasting antibiotics on my other daughter. It’s no fun. For anyone. But then I used a tried and true “magic” trick that always works for my kids. I got down low and said one simple thing to her. The two-year-old stopped screaming, looked at me, thought about my words, and opened her mouth for her mom to pop the medicine in. And just like that, the medicine-drama was over. She got her medicine, my friend didn’t have to force her daughter to do something she clearly didn’t want to do, and we averted major drama and major mom guilt. I didn’t beg the little girl. I didn’t threaten or bribe her. We’ve all tried those “old school” tactics and we know they only work a quarter of the time. And then everyone walks away feeling spent and exhausted and like they need to day-drink. So what calmed her down and had this little girl complying and ready to take her medicine without a fight? And not just any choice, but a choice I could live with. She still needed to take the medicine. That wasn’t optional. But how she took the medicine could be up to her. She thought about it and opened her mouth wide for her mom. Because all of a sudden, even with that simple choice, she felt in control. She felt like she had a say in what happened to her. She was empowered to choose for herself. The adults didn’t need to be in charge of that decision, so she could be. And we got what we needed to happen… the medicine was taken. But she also got what she wanted. She had a say in the whole process and didn’t feel the need to fight us off. Our children are constantly being told what to do. They’re told when to eat, when to sleep, and when to hold our hands. We pick out their clothes, their food, and their cup color. And we do it all while we physically tower over them. A little person with big emotions will struggle to let us know they want to be heard. That their voice feels small. That their place in the world feels insignificant and powerless. Enter the meltdowns and tantrums. If, however, we take a minute to give them a voice, to listen to their choices, and to make them feel part of the decision-making team, they’ll buy in. They’ll do what we need them to do. They won’t need to have a tantrum to be heard. They will already feel like they are in control. And we won’t have to yell, get mad, beg, threaten, bribe or feel like we are failing as moms. Sometimes, in the heat of the moment, it can be hard to give a toddler a choice you can live with, but still gets the job done. It takes practice and a little pre-planning. Eating a meal in peace? Leaving a playdate or the park or school? Could you let them choose between three chicken nuggets or four? Could you let them choose their plate and cup? Could you let them choose apples over strawberries? Could you offer them dip with their veggies or no dip? And even if you know how they will choose, you still offer up the choice. I know my kids’ preferences to most things. But asking them—even though it’s more work for me, is worth it. Because then we eat a meal without fights. We get dressed without doing battle. And we leave a friend’s house without me fuming and vowing we’ll never have another playdate again. 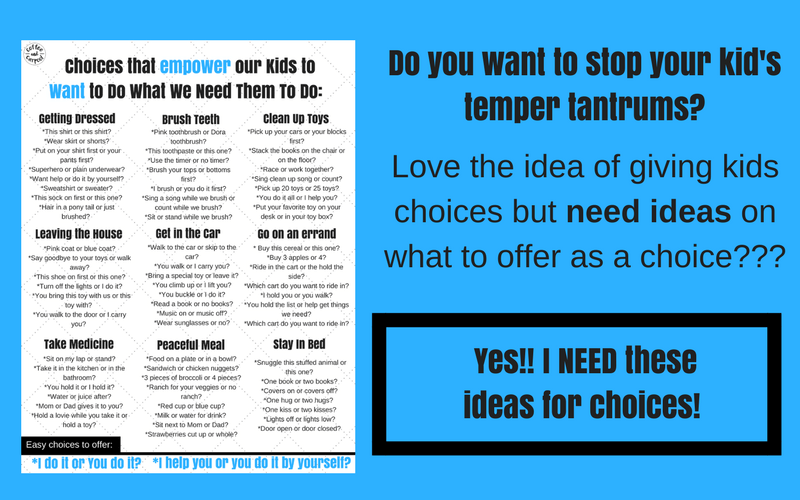 Need ideas on simple choices you can give your kids that you can live with? 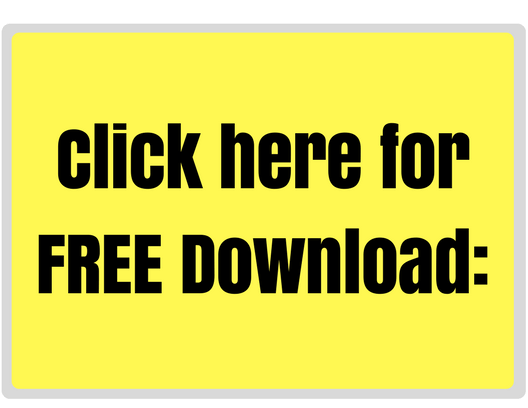 Click here for the free list! While they’re deciding which choice they want, they’re doing what you need them to do. Purple shoes or red shoes? Right foot or left foot first? I do it or you do it? Red jacket or black jacket? Bring a toy with or leave the toy home? Wear sunglasses or don’t wear sunglasses? Walk to the car or skip to the car? I carry you or you hold my hand? You hold this hand or my other hand? You hold Mama’s hand or Daddy’s hand? You climb up or I lift you up? You buckle in or I do it? Music on or music off in the car? Do you want to read a book or no book when we drive? When all else fails, I offer up: I do it or you do it? They feel in control and I get them in the car without a fight. It’s a win-win parenting moment. I don’t feel like I just went 9 rounds and I’m not emotionally-spent by the time we pull out of our driveway. This one simple change makes me a calmer, happier mom and I can spend my time enjoying this rollercoaster ride of motherhood rather than just surviving it. And here’s the truly magical part: offering choices works for older kids as well. You can do your homework in your room or at the dining room table. You can brush your teeth for two minutes or I can do it for two minutes. You can empty the top of the dishwasher or the bottom of the dishwasher. You can pick up your stuffed animals first or you can pick up the dirty clothes on your floor first. I can buckle your helmet or you can buckle your helmet. Helmet wearing, homework completion, and chores are not optional. They have to do it. But how they do it is up to them. And when they make the choice, they stick with it. With fewer eye-rolls, fewer stomps of their feet, and less complaining. Because here’s the deal. This parenting gig is hard enough. And not battling a child do something as “simple” as putting on their shoes, wearing a helmet, or taking their medicine makes it easier. It makes my mom-life more enjoyable. Which in turn, makes me a better mom overall. And if someone offers me a choice between being a happy mom and being an irritable mom, that’s an easy choice for me to make. I will feel empowered to choose ‘happy’ every time. 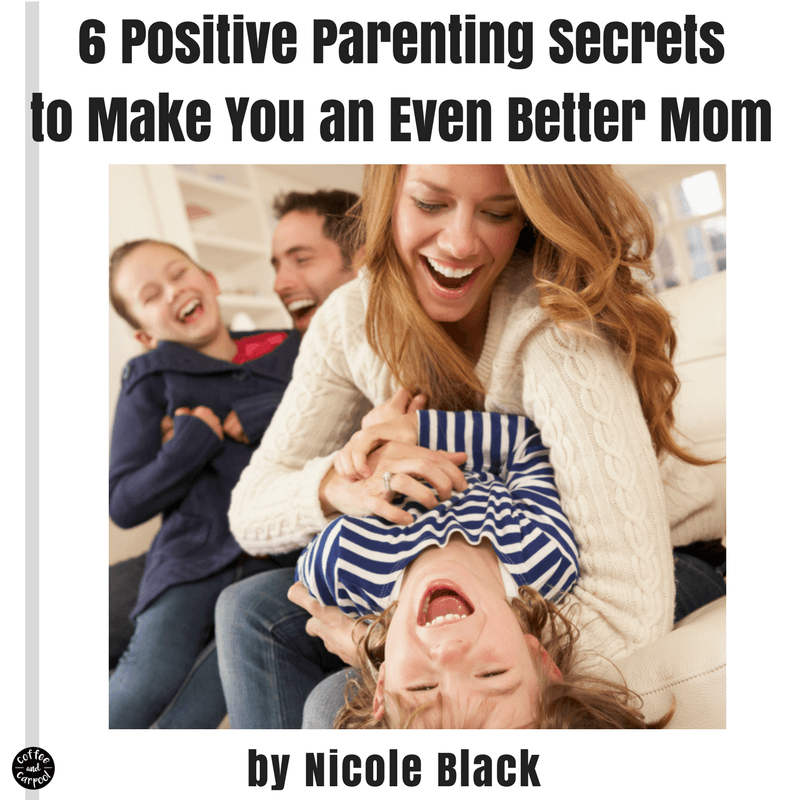 Do you want more mom hacks that will make your life easier, calmer and more peaceful? After having 3 children I thought I had it all figured out. Apparently not, lol. This was amazing how well it worked and I have continued to give my daughter choices which has made my daily life much easier! I appreciate your Words of wisdom and will continue to learn from you every day my friend! You’re so sweet Ena! Choices make all things easier! !